Oto-Shigure, a high-tech umbrella that functions as a personal audio speaker system, gives music lovers a reason to dance in the rain. Developed by Keio University and IT company Toa Engineering, Oto-Shigure looks like an ordinary traditional Japanese umbrella made of bamboo and oiled paper, but the entire object emits sound when connected to an iPod or other portable audio device, thanks to a tiny built-in amplifier and four small vibrating motors mounted along the periphery, which effectively turn the canopy into a large speaker cone. 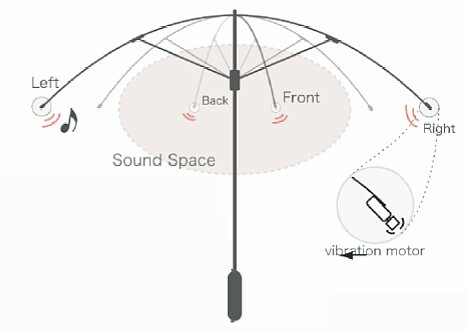 The umbrella produces a highly localized three-dimensional sound space audible only to the people underneath, so it can be used in public without disturbing the peace. After filing a patent application for Oto-Shigure last September, inventors Yusuke Kamiyama and Mai Tanaka worked with Toa Engineering to complete a prototype earlier this year. They are now showing it off to the public to gauge user interest. 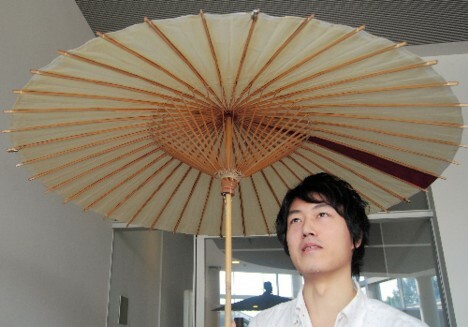 If the response is positive, they plan to begin selling the audio umbrella next year for under 10,000 yen ($100). If houseplants could blog, what would they say? 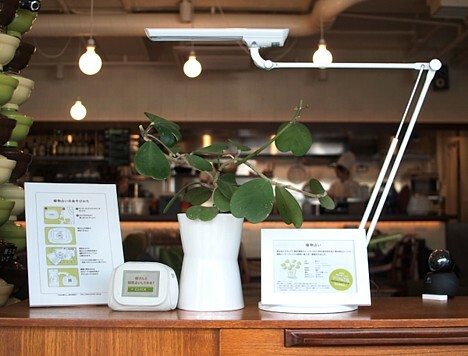 To find out, Kamakura-based IT company KAYAC Co., Ltd. has developed a sophisticated botanical interface system that lets plants post their thoughts online. A succulent Sweetheart Hoya (Hoya kerii) named "Midori-san" is now using the system to blog daily from its home at bowls Donburi Cafe in Kamakura. The plant interface system, which is built around technology developed by Satoshi Kuribayashi at the Keio University Hiroya Tanaka Laboratory, uses surface potential sensors to read the weak bioelectric current flowing across the surface of the leaves. 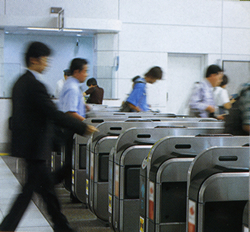 This natural current fluctuates in response to changes in the immediate environment, such as temperature, humidity, vibration, electromagnetic waves and nearby human activity. 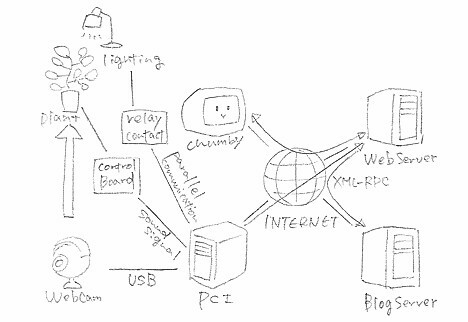 A specially developed algorithm translates this data into Japanese sentences, which are used as fodder for the plant's daily blog posts. 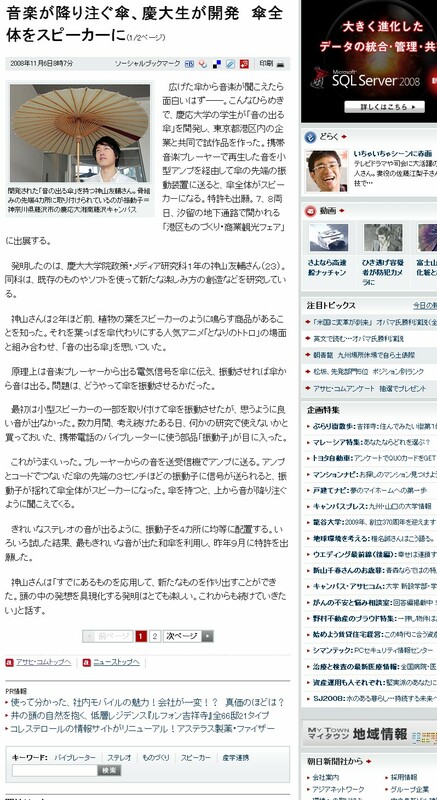 Midori-san started blogging about a week ago. So far, the plant's highly structured posts summarize the day's weather, temperature and lighting conditions, describe its overall physical condition, tell how much light it received via the user-activated lamp (see below), and explain how much fun the day was. Each post also includes a self-portrait photo and a plant-themed pun (in Japanese), which Midori-san likely did not write. A graph at the top of the sidebar shows the plant's surface potential in real-time. 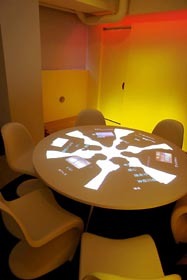 Once the lamp activated, the widget shows a real-time view of Midori-san under the light. Judging from the blog content and the numerous "thank yous" below the fold of each post, Midori-san seems to really appreciate every chance it gets to photosynthesize. In addition to exploring the potential of intelligent networks that involve the natural environment around us, KAYAC hopes this entertaining plant interface system will inspire people to think about the environment in new ways. 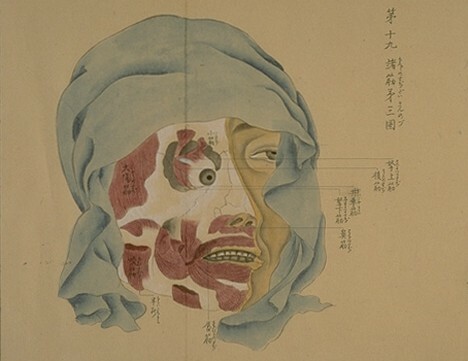 The Kaibo Zonshinzu anatomy scrolls, painted in 1819 by Kyoto-area physician Yasukazu Minagaki (1784-1825), consist of beautifully realistic, if not gruesome, depictions of scientific human dissection. 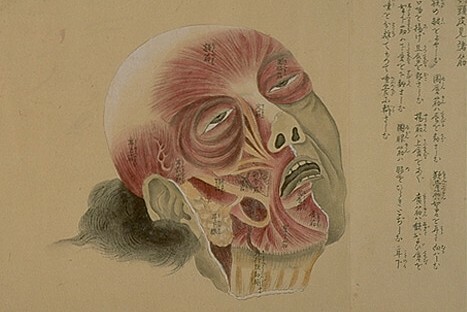 Unlike European anatomical drawings of the time, which tended to depict the corpse as a living thing devoid of pain (and often in some sort of Greek pose), these realistic illustrations show blood and other fluids leaking from subjects with ghastly facial expressions. 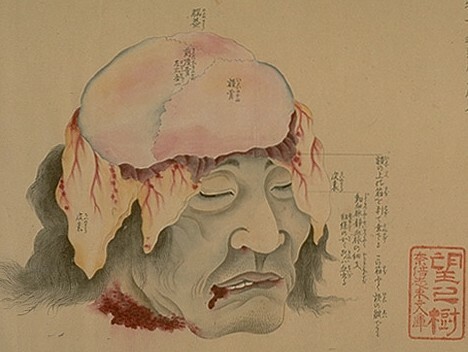 The fact that the bodies used in scientific autopsies in Edo-period Japan generally belonged to heinous criminals executed by decapitation adds to the grisly nature of the illustrations. 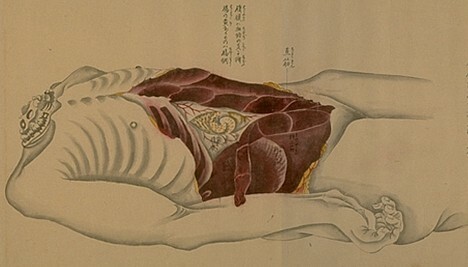 According to the Keio University Library (where these documents are currently stored), the two scrolls contain 83 illustrations based on Minagaki's observations of over 40 bodies. 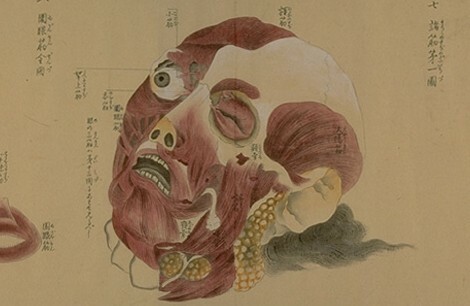 They are regarded as the best collection of early 19th-century anatomical drawings by a Japanese hand. 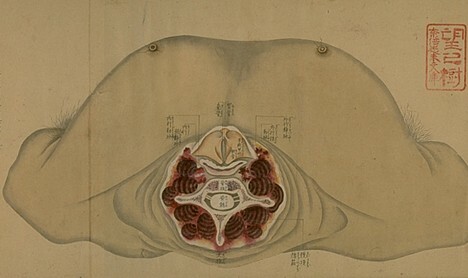 The first scroll includes a handwritten compliment by Philip von Siebold, the German physician credited with being the first European to teach Western medicine in Japan, who was reportedly impressed by the quality of the drawings when he observed them in 1826. Siebold's note, in Dutch, reads: "This anatomical research has been carried out with great diligence and should therefore achieve great recognition." 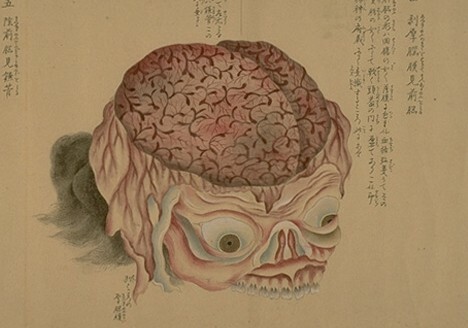 In 2003, Japan's Ministry of Culture designated Kaibo Zonshinzu an important cultural property, saying that the scrolls, which were produced as a result of actual observation and based on Dutch scholarship, demonstrate the level of knowledge that medical science reached in the Edo period. In a move that could provide a crucial boost to our robotic friends struggling up the near side of the Uncanny Valley, major cosmetics manufacturer Kao Corporation and a Keio University research team led by robotics professor Takashi Maeno have developed an artificial skin that feels just like human skin. Skin, the largest organ of the human body, consists of a soft layer of tissue (dermis) covered by a tougher protective layer (epidermis). The artificial skin developed by Kao and Keio mimics the feel of human skin with a 1-cm thick "dermis" of elastic silicone covered by a 0.2-mm thick "epidermis" of firm urethane. Countless tiny hexagonal indentations etched into the urethane epidermis provide it with a very realistic texture. In a series of unscientific tests, 10 out of 12 people who touched the skin thought it felt like human skin, while equipment designed to measure the mechanical properties of skin confirmed the artificial skin had characteristics resembling human skin. The skin was unveiled earlier this month at the 24th Annual Conference of the Robotics Society of Japan (RSJ) at Okayama University. While Kao plans to use the artificial skin in the development of new cosmetics, Professor Maeno sees potential applications in the field of household robotics, where there are many opportunities for human-robot interaction.